“After the explosion, a swarm of journalists came. 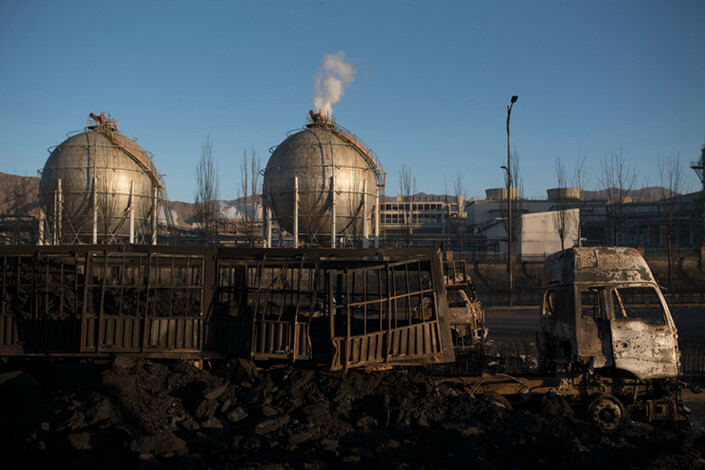 Now there’s no sign of them,” a villager complained, one month after a deadly chemical explosion on the outskirts of Zhangjiakou, the city in North China’s Hebei province that will host most of the 2022 Beijing Winter Olympics’ skiing events. On the morning of Sunday, Nov. 28, an explosion occurred outside a chemical plant in Qiaodong district, killing 23 people and injuring 22. The official investigation found the blast was caused by a leakage of vinyl chloride gas from Shenghua Chemical Co. Ltd., owned by the state-backed China Chemical Group Co. (ChemChina). When the leaking gas met an open flame, it caused a deadly explosion that was so severe it burned to a crisp some trucks lining the nearby highway. But after one month, public interest in the disaster waned. The provincial highway was cleared of debris and charred trees along the road were cut down. Only the south gate of the Shenghua complex, and the blackened office building across the road, remain as evidence of a tragedy that happened just two months ago. Soon after the blast, on the evening of Nov. 30, 15 Shenghua employees were detained by police. Since then, “responsible persons” from the enterprise, its parent company, and the Zhangjiakou government have been interviewed by officials from the State Council, China’s cabinet. But leaking vinyl chloride gas is not the only environmental breach that has been attributed to the plant. Provincial officials found it to be violating environmental and safety standards on at least three occasions in 2018, 2017 and 2014. And people living in Beiganzhuang and Meijiaying villages around the plant said they had filed many complaints because of excessive pollution. But no changes were ever made. “So many years and we’ve never had a single response,” one of the local villagers said. At the end of December, Caixin discovered that many manhole covers on Provincial Highway 310 near the Shenghua complex had been removed. Beneath the surface, hot and pungent sewage was flowing in the huge underground pipeline. A villager from nearby Meijiaying village said that a well near the east gate of the complex, which often emits white gas that smells like ammonia, was also missing its cover. The reason for the missing manhole covers? The explosion. Shenghua maintained private drainage pipelines that directly discharged wastewater contaminated with saturated vinyl chloride into the municipal pipeline network. A circular released after a Dec. 2 meeting of the Security Committee of the State Council and the Ministry of Emergency Management reported that the gas storage tank holding vinyl chloride at the Shenghua plant operated through a water-sealed system. This involved water being used to maintain the correct pressure and resulted in the water becoming contaminated with the chemical. “Wastewater containing saturated vinyl chloride is directly discharged into the local municipal pipeline network through a private drainage pipeline without treatment, which seriously threatens the safety of the municipal pipeline network,” the circular read. The Shenghua plant has been responsible for no shortage of troubles for the villagers. From when the land was expropriated to the company in 2009 to when it began production in 2012 and beyond, the villagers say they have been plagued by the effects of pungent odors, scattered dust, sewage discharge and accumulated solid waste. But what really worries them is that the water pumped from deep wells is becoming harder and harder to drink. Even their crops have been poisoned. In April 2013, villagers found that using water pumped from the wells to irrigate their newly-planted seeds killed the grass at the edge of the field. They also discovered the water they drank was progressively becoming saltier and had a peculiar smell. Many villagers told Caixin they saw a huge seepage pit enclosed by a fence near the river and near the Shenghua sewage treatment station. Satellite photos taken by Google Earth also recorded changes around several villages at that time. A photo taken in December 2012 shows that there is indeed a “gourd-shaped” seepage pit along the Shahe River, and a large pit north of Shenghua’s sewage treatment station. Villagers pointed out to Caixin’s reporter that Shenghua drained the sewage at that time into the seepage pit by the Shahe River. They suspect that after the winter ice and snow melted, the contaminated water seeped into the soil and polluted the surrounding groundwater. Many villagers in Beiganzhuang said they had repeatedly asked governments at all levels to investigate the issue of groundwater pollution in the area. But the answer was always that “the groundwater is not polluted and is safe to drink.” In late May 2013, villagers massed to block the south and east gates of the Shenghua complex. About three days after the blockade, dozens of unidentified people brandishing sticks and knives rushed through the complex’s east gate in the early morning, smashing villagers’ cars and injuring one person. Shenghua eventually agreed to build two mechanical wells in an elevated position for Beiganzhuang. It also spent more than 3 million yuan ($446,000) in compensation, giving each person in the village about 2,000 yuan. Residents of Meijiaying village also participated in the 2013 blockade. In August 2015, several of them took a complaint letter to the provincial environmental protection department. “Shenghua Chemical's solid waste is dumped and sewage is discharged at will, seriously polluting the surrounding environment and underground water sources,” the letter said. “The pH level of the dumped industrial waste is 3, which means it has strong acidity. Villagers have repeatedly asked for water quality testing,” the letter continued. “The relevant departments only extract water samples, and the results of the testing have never been announced to the villagers.” Photos were attached as evidence. The letter also alleged that the county environmental protection department was not effectively managing the Shenghua sewage treatment plant and the company was discharging its wastewater into a large pit. The sewage treatment plant the villagers referred to was in the industrial park, next to the Shenghua sewage treatment station. When Caixin visited the site, the plant was not guarded. There were stacks of new radiators piled in one room, yet to be installed. Treatment ponds were filled with sewage. In the below-freezing temperatures, the sewage pool was covered with a thick layer of ice, and sewage spilling from pipes was frozen. On Nov. 26, two days before the deadly explosion, the results of the Hebei authorities’ environmental inspections were published online. The report said that Shenghua was polluting the groundwater of Beiganzhuang and Meijiaying villages and the water required testing. The tests revealed the groundwater in Meijiaying was seriously polluted and was not drinkable. 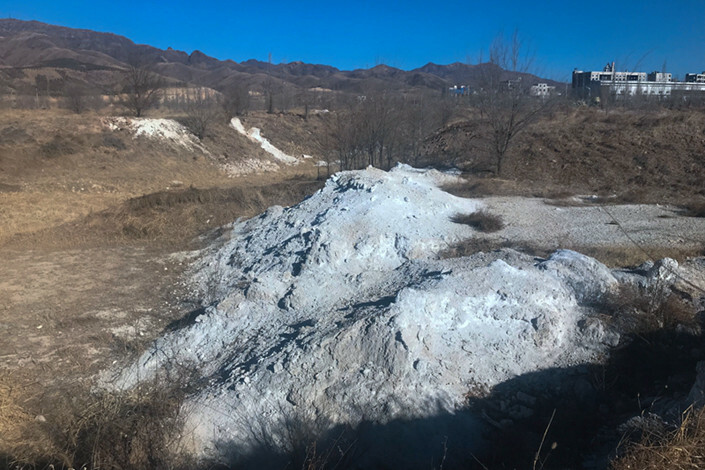 At the end of December, environmental volunteer Chen Wenxi visited the Zhangjiakou Environmental Protection Bureau to discuss Shenghua’s pollution. Zhang Hongli, leader of the management group set up after the explosion, told Chen that the Zhangjiakou government could not disclose, without authorization, information about the disposal of chemicals after the explosion. “As for what happened before the accident, I don't know,” he said. 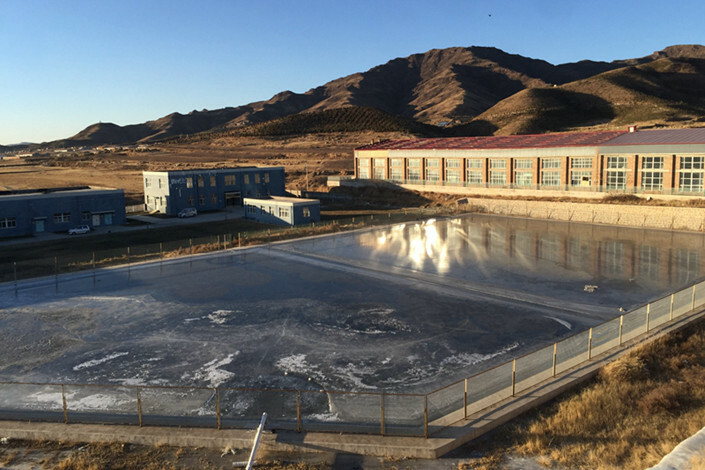 Zhang said the Zhangjiakou Environmental Protection Bureau had commissioned the national monitoring station and a qualified third-party testing agency to assess the groundwater quality of five surrounding villages. The official test report found the groundwater in all villages was fine and the test results had been reported to the municipal government. Zhang also said that under normal circumstances, Shenghua’s waste water was recycled within the plant — the plant has “zero discharge” — and he did not know the purpose of the seepage pit. The Zhangjiakou Environmental Protection Bureau did not reply to Caixin’s inquiries about the pollution of groundwater from seepage pits. Caixin was not able to get comment from Shenghua. 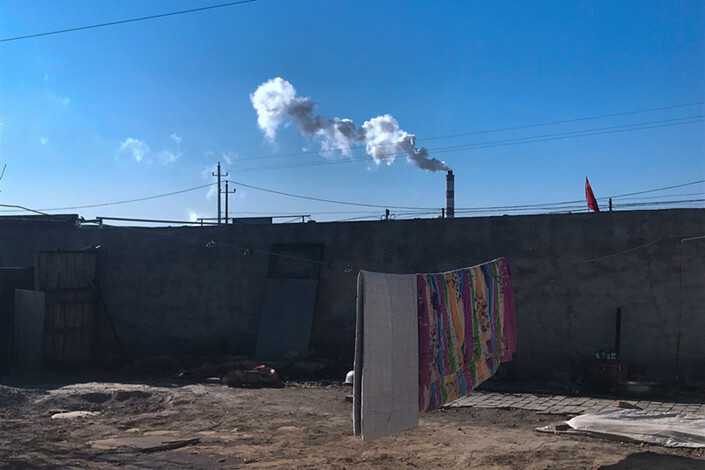 Residents around the Shenghua plant have long been accustomed to the effects of dangerous gases such as vinyl chloride and acetylene. Meijiaying villagers’ houses are situated only a few hundred meters from the plant. Many villagers said they remember the chemical factories emitting a pungent smell at night. Some said that the highway would often be covered in a blanket of white dust. “It looks like morning fog and covers the road like a thin layer of frost,” one villager said. Many villagers told Caixin that when they ventured along the highway outside Shenghua complex they would need to cover their mouth, nose and eyes, or they would choke on the dust. Most of the elderly people in Zhangjiakou remember a vinyl chloride explosion 27 years ago on the site of the Shenghua plant. It was then home to a resin factory and the December 1991 explosion caused five deaths and injured eight people. It was caused by sub-standard steel being used in production. The factory building also did not meet safety standards. There was also a gas explosion, resulting in one death, at the Shenghua plant after it moved to the industrial park. The accident investigation report said the explosion was caused when sparks ignited acetylene produced by calcium carbide reactions. Villagers said that black smoke was often seen coming from the huge chimneys of Shenghua’s plant. Data produced by Green Net Environmental Data Center shows that between Nov. 1 and Nov. 27, the plant’s total emissions were 63 times higher than the standard. “If the online monitoring system detects that emissions are 63 times higher than the standard, it should have come up ‘red’ or with an alarm on our system,” said Yu Xufeng, deputy head of the supervision center of Zhangjiakou Environmental Protection Bureau. “Standard procedure dictates that the information center should transfer this information to law enforcement. I personally don’t think that so much excess emissions would go unnoticed,” he added. Chen Wenxi, an environmental volunteer, gained access to the official penalty records of the Zhangjiakou and Hebei departments of environment and ecology. Shenghua was fined more than 10,000 yuan in July 2017 for not submitting impact assessment documents for the construction of new buildings at the complex. “This is only a procedural penalty, and there is no information on regulatory penalties for emissions,” Chen said. After the Nov. 28 explosion, the future of this chemical enterprise is still unknown, but Meijiaying villagers suspect that the violations, dumping and pollution will continue as if nothing had happened.